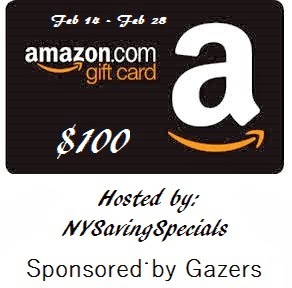 Happy Valentine’s Day and welcome to the $100 Amazon Gift Card Giveaway! Here’s a way to make your honey’s day a bit sweeter or for that matter your own! Be sure to come back each day for extra chances to win the $100 Amazon Gift Card. And if you are the lucky winner, you get to go shopping. And that’s always fun. Thanks for stopping by and Good Luck. Disclaimer: My Best of Both Worlds is not responsible for the awarding of the prize. My Best of Both Worlds was NOT compensated in exchange for this publication. No purchase necessary. Void where prohibited by law. The sponsor will be responsible for product shipment to winner of the giveaway. Sponsor will be responsible for prize fulfillment. This event is in no way associated with, sponsored, administered, or endorsed by Facebook, Twitter, Pinterest, Google, and any other social media are not affiliated with this posting or giveaway. This disclosure is done in accordance with the Federal Trade Commission 10 CFR, Part 255 Guides Concerning the use of Endorsements and Testimonials in Advertising.